Castle Fisheries fishing on the River Derwent, one of the finest salmon and sea trout rivers in the north of England. 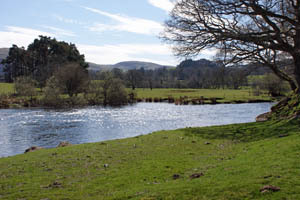 The River Derwent and Cockermouth Castle have been in the ownership of Lord Egremont's family for generations. The Derwent rises beneath Scafell Pike, flows through Derwentwater and Bassenthwaite Lake and then passes through the rolling countryside of the Derwent Valley before entering the Irish Sea at Workington. We have ten beats in total, both upstream and downstream of Cockermouth, each with its individual characteristics and features. 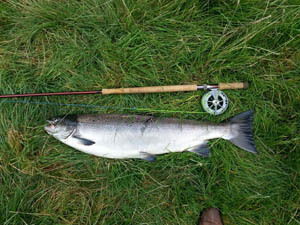 In the right conditions, the Derwent provides good runs of salmon throughout the summer and autumn. The summer months can also produce some very good sea trout fishing. 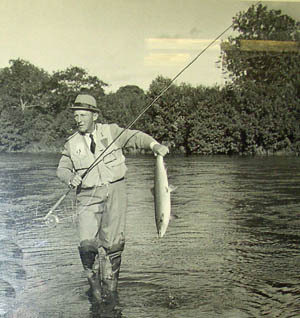 The river holds an excellent population of wild trout, producing some very good early sport and some large fish. Most of our fishing is double-bank, with numerous streams and pools, the majority of which provide easy wading. Fishing huts are provided on most beats. Friendly and experienced ghillies are available to assist, if required. We are pleased to confirm that Armathwaite, immediately below Bassenthwaite Lake, and Robin Hole, downstream of Cockermouth, are now available for the first time this season, offering further variety and two excellent, but previously lightly fished, salmon beats. We operate a flexible booking system in order to accommodate both syndicate and weekly/day ticket fishing. 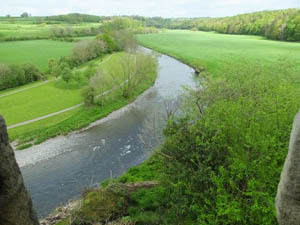 Much work has been carried out recently to restore the banks and improve the fishing, which is now of a very high standard, managed from the old Estate Office at Cockermouth Castle. If you have fished our water in previous seasons, we hope to welcome you back again this season. If you have not fished with us before and would like to know more, then please do make contact. We will be delighted to discuss your requirements and to show you the beats that we have on offer.